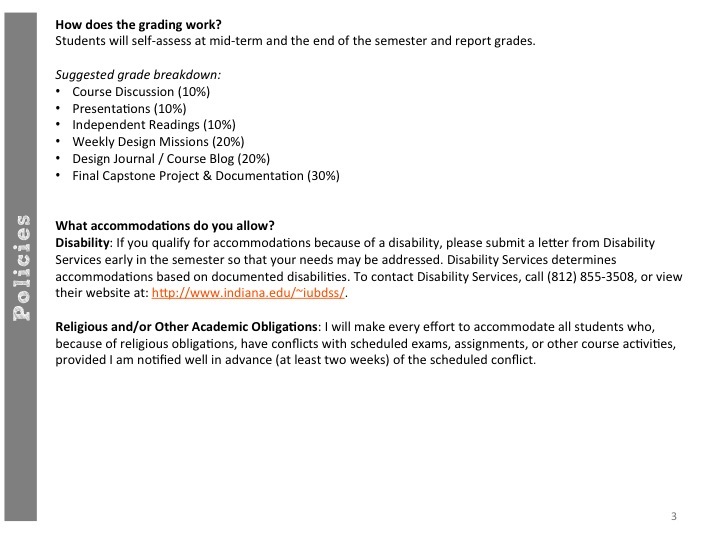 Does this proposed syllabus accurately reflect our earlier discussions and the ongoing evolution of the course? How so? Do you have any specific suggestions for how you might edit the document? Please be as specific as possible in your feedback. Would you like to see field trips and/or guest speakers added to our schedule? If so, what are your suggestions? When would you like to see them happen. Any additional questions for me? 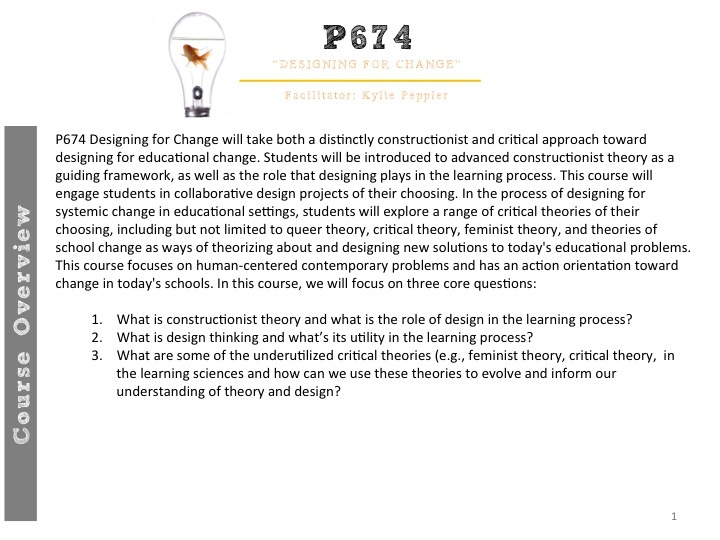 A couple of additional notes: Note that the critical readings will be taken up in relevance to your project and will consist say readings on “Designing Curriculum” and “Feminist Theory” to investigate critical praxis informed by feminist theory. We’ll collectively investigate readings that would be informative to your areas of interest and your capstone design projects. Also note that the readings on the course schedule are inserted the week in which they are assigned — they would be due the following week. 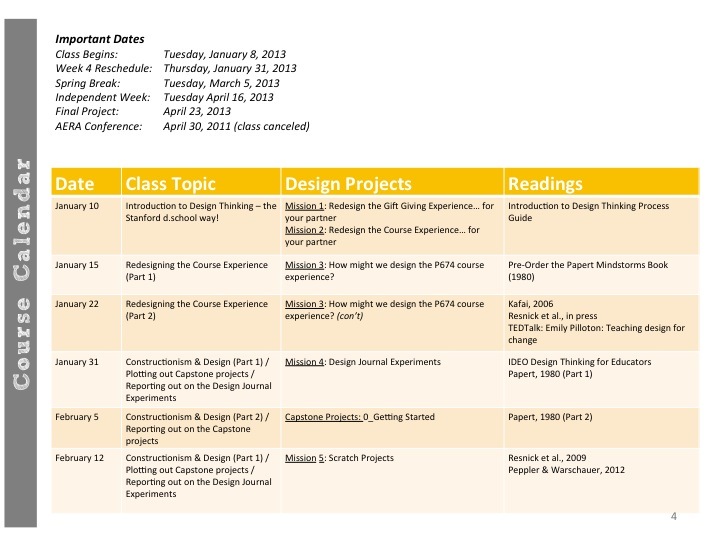 1) Format of the capstone project. Will we be looking mainly at the Design Thinking workbook? Do we also write, drawing from the readings in class, as well as our independent readings? 2) For Critical Theory, will we have suggested readings? I am new to this, and what I have read is mainly from Carspecken (1996), Critical Ethnography in Educational Research. Good questions Verily! This of course is subject to the class approval but here are my suggestions. — I think about the Design Thinking Workbook as a draft/internal space. You can of course post excerpts (and I hope you do!) to the blog, but the workbook is meant to be used to guide the process. What I like about it, is that every team will need to progress in their timeline at a different pace. This allows the teams to work ahead, so to speak, as needed. I also suggest that we turn in these design workbooks at the end of class as it will be a good way to share out so much of the invisible work being done outside of the course. Additionally, we want to try and push ourselves to explore the IDEO design thinking process and not shortcahnge steps that we might not see the utility for until later in the design process. 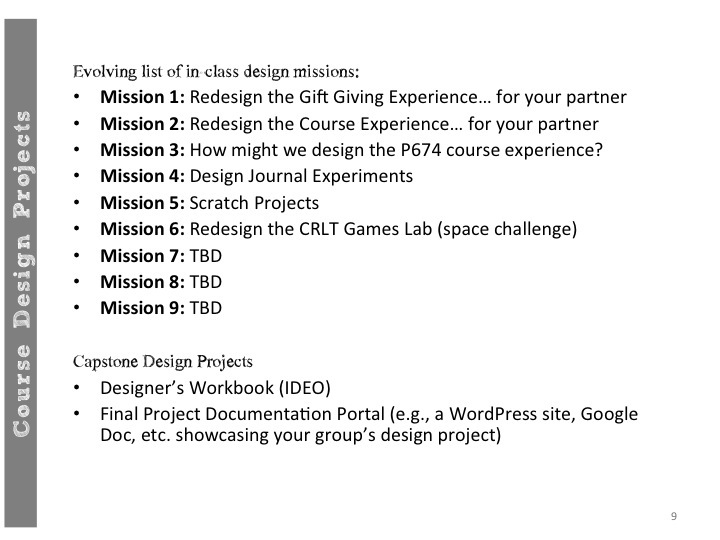 In short, I wouldn’t want each of us designing our own design thinking process at these early stages — rather the intent would be to try on this process for the course and the critique away in future iterations! You should (and I highly encourage you!) create your own design thinking process based on your accumulating insights. 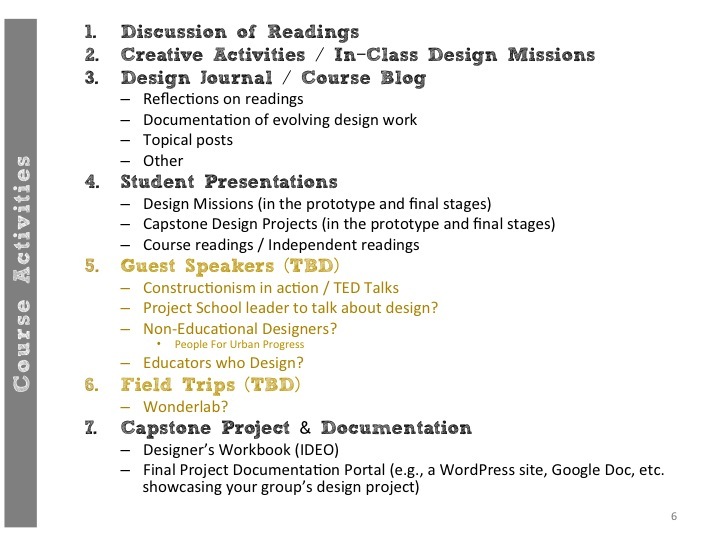 The other part of the capstone project is TBD but should be more public facing to showcase what you designed, how you went about the process, and how your research informed the process. I could easily see this as a Google Site or WordPress page but it could be done in typical paper format if you think that is most appropriate. While text and reflection would be important, I would value documentation and reflection on the purposeful design decisions in a multimodal format — i.e., can others get a sense of the project best through a combination of video, images, and text? — My suggestion is that we explore this mainly through our independent reading lists and that each of us specialize in a particular theory, choosing readings to support these explorations. I can be a resource but others in the SOE and across campus that have expertise in these areas could similarly act as a resource to help you create your reading list. 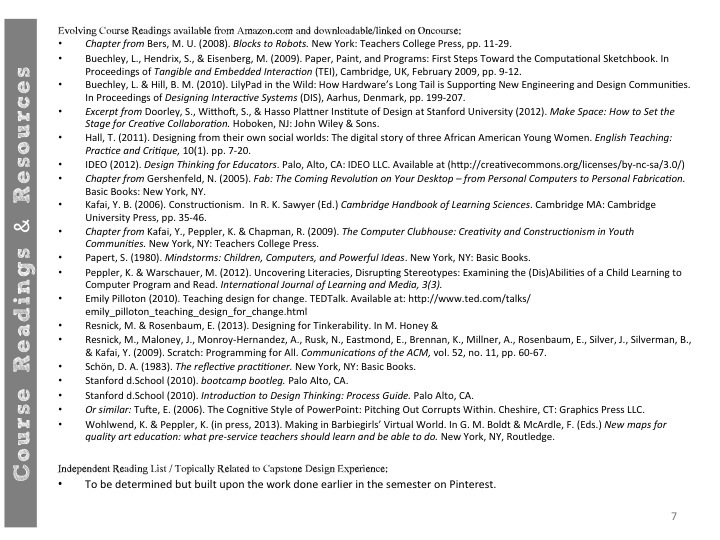 All of this is TBD — I think that I propose that we create these reading lists at the start of March and then I have proposed time to do these readings and slots for individuals to present their evolving theoretical understandings in class in the “student presentations”. Looking at what you see here, I realize that you would have needed some strong mind reading skills to infer all of that from the text above 🙂 Again, good questions Verily! 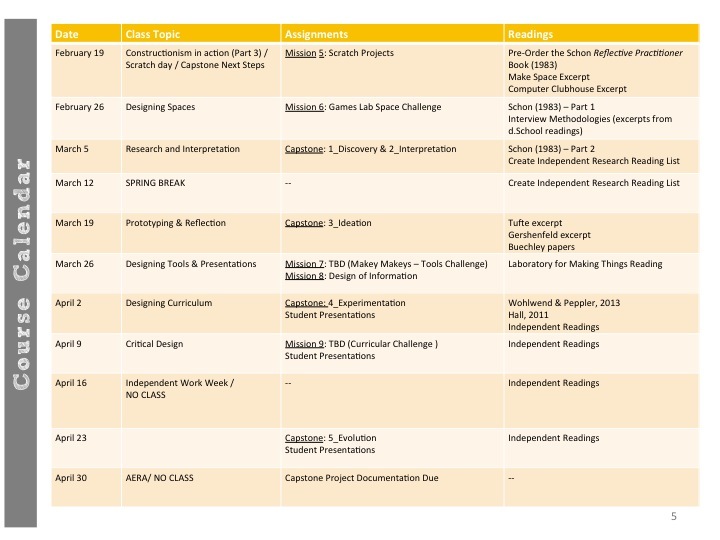 I generally like the way the syllabus is shaping up. I don’t have further speakers/field trip requests – I’d love to visit Wonderlab, and think that both Daniel from BPS and someone from People for Urban Progress (if we can make this work) would be really interesting. What is People for Urban Progress? I have been to WonderLab before and I would like to go there again. I think WonderLab would be a good option for field trip since WonderLab offers a variety of hands-on exhibits and programs. Maybe people from WondeLab talk about how they design the space and exhibits, which could be appropriate with “guest speaker activity”. We can kill two birds with one stone. ooo, I vote for a dual field trip/guest speaker event at WonderLab too!! Vote for field trip at Wonderlab!! -On slide 3 you have the “suggested grade breakdown” but I thought we decided in class that we weren’t going to have grades? -About the course calendar: is everything going to be due at our last class on the 23rd? 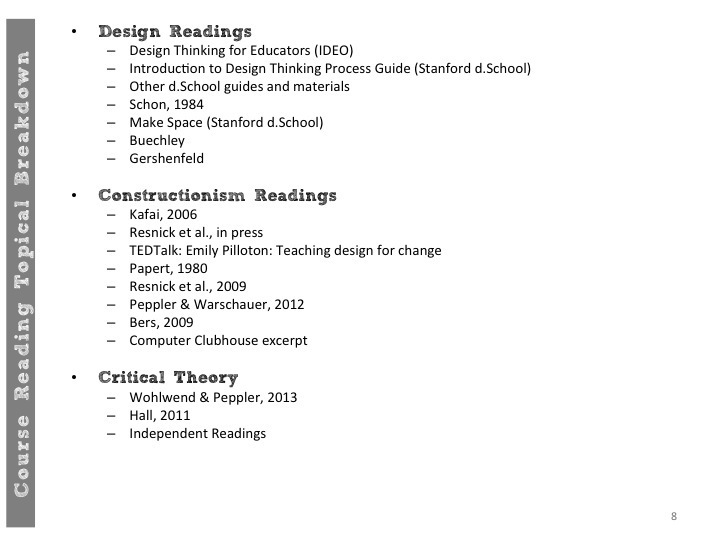 -About independent readings: I know in response to Verily you said that you could be a resource to help us determine our specific readings, but choosing our own readings feels overwhelming to me because I really have no prior experience with design, constructionism, or critical theories. -Can I suggest a possible mission? If so, it would be great to do a collaborative redesign of a system because I am really struggling to wrap my mind around what that might look like. Perhaps we can begin our search for relevant independent readings in class? That way, we can ask each other about readings we find, and those who have more experience can suggest things.